TRUE OCEANFRONT WITH PANORAMIC VIEWS!! 1st CLASS ACCOMMODATIONS! Our condo is an ocean front corner unit that has amazing panoramic floor to ceiling views of the ocean and beach for miles. With an open floor plan for the family living area, dining area and kitchen you have amazing views of the ocean all around you! Each of the two bedrooms has a private balcony, while the living area boasts an additional two large balconies, each very roomy with amazing views. Lots of upgrades to the condo and extra special touches for our guests that go above and beyond. Located in the prestigious Kingston Plantation, a 145 acre oceanfront gated resort with freshwater lakes, walking trails, a brand new state of the art health club and sports complex. The living area has comfortable furniture that was just purchased in late August 2016. We recently added a built in that contains the flat screen TV, an AV receiver and speakers, and an electric fireplace! (The fireplace actually heats the room if you are a snowbird coming to enjoy in the winter, but you can turn the heat off and just enjoy the ambiance provided when it isn't needed). The large Master Suite has a king size bed, flat screen TV, en-suite bath (double granite vanity, a beautiful tile walk in shower with glass doors, state of the art showers).This bedroom has a private balcony looking straight out to the ocean. Great balcony to enjoy sunrise or sunset with your favorite beverage! We recently added a sofa/futon in the Master bedroom if you need additional sleeping accommodations. The large guest suite has two queen beds, flat screen TV, blu ray player, en-suite with tub/shower combo (newly renovated) and a private balcony with gorgeous views of the beach. This room has a private entrance if desired. Kitchen is fully equipped and includes stainless steel appliances. Best of all, you still have great views of ocean even from the kitchen! Dining table seats 6 with counter seating for four. The unit is equipped with full size stacked washer and dryer. Linens and towels are provided at no extra charge. Beach towels are normally not provided; however if you are flying please let the owner know and we can provide beach towels as well. Sheets and towels are higher quality than normal. There is no housekeeping during the week but if you request it we can provide it at an additional charge). We provide a hair dryer and nice makeup mirror in each bathroom. There are two pools located on each corner of the South Hampton building to enjoy! Additionally, our guests can have access to the resort’s state of the art Sport & Health Club for a charge of $15/day/person over 16 years of age. The indoor pools, hot spas, cardio and weight room, workout classes and other amenities are available as are the tennis and racquetball courts. Badminton is open to all and there is a wonderful picnic and BBQ area next to the Sport and Health Club. Take a tour! We offer our guests beach chairs, a small table, beach umbrellas, boogie board and sand toys for your use on the beach during your stay. We have just completed a renovation to the unit--adding new flooring throughout, granite counter tops, Master walk in shower, very nice European shower fixtures, brand new washer and dryer, beautifully decorated. If you are a coffee drinker, we offer two types of coffee makers in the unit, but if you are a die hard Starbucks fan there is a Starbucks right next door in the Embassy Suites. The Embassy Suites is easily accessible from our lobby via walkway. Our unit is beautiful and views from every room are breathtaking. You will not regret choosing Cloud Nine for your vacation! We love the beach and fell in love with Kingston Plantation. It is beautiful, quiet, has gated security, and offers all the amenities you could ask for. Once we walked into this unit we were sold by the amazing views and spacious room. My husband and I just purchased this unit in July, 2016. We just completed renovations in January 2017 adding granite counter tops, enlarging the kitchen, new flooring throughout, and bathroom remodels with tile showers and tub unit. This is our first VRBO experience so we look for your feedback as we grow this adventure. Views, views and views! Also the unit is very spacious with over 1300 square feet for two bedrooms and two baths. And yes, because it is in Kingston Plantation. We looked at units in each of the towers in Kingston Plantation. Even though South Hampton is the oldest building, none of the others provided the views and the square footage that our unit has to offer. Kingston Plantation is off the main highway it is a quiet, serene environment even though there are 4 other towers on the premises. We think of it as paradise! Anything you need is right there. If you want Starbucks, there are two right in Kingston Plantation. Need a health club? There is a premium Sport & Health Club within Kingston Plantation. Health Club offers Spa services as well. Two pools, awesome views that you won't see in many other buildings, 400 square feet of balcony space, and did we mention the views! There are two outdoor bars - One located on the Hilton Hotel property and one on the Embassy Suites property - all accessible via the boardwalk. Tanger Outlets is a mile away, while there are restaurants, gas stations, grocery stores and shopping all around. And last but not least, we provide all those little "extra touches" for our guests to make sure they feel special while on vacation. 2 Bathrooms. Each bedroom has private bath. Both baths were recently renovated and have nice tile, granite counters, gracious storage, hair dryer and makeup mirror. The master bath is a beautifully tiled walk in shower with european shower while the guest bath is also beautiful tile with a tub/shower combination which also has the european shower system. Front balconies look directly out to the beach and ocean. Gorgeous! Side balconies provide miles of beach/ocean views. Every room provides views that cannot be beat! There are various beautiful lakes within Kingston Plantation. Fishing is allowed but any fish caught must be returned to the lake. 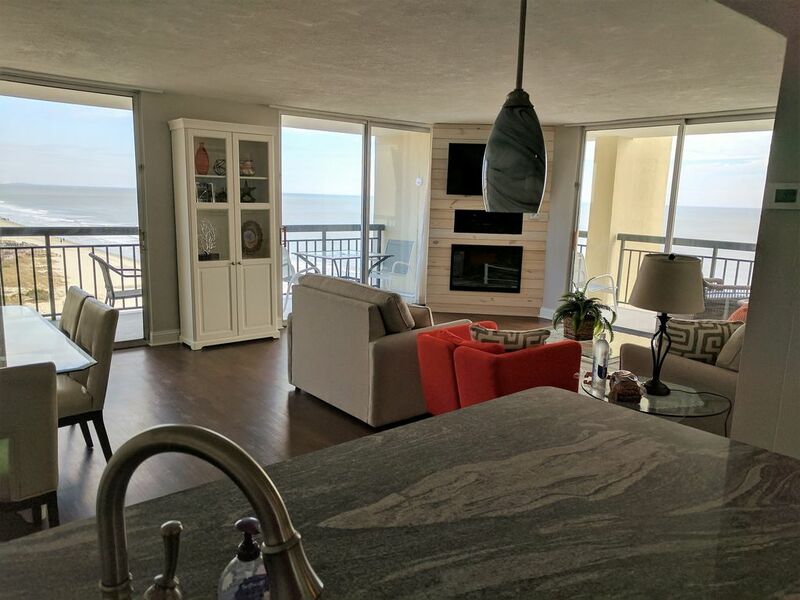 Our unit is literally ocean front with views of the ocean from each room! The beach is literally right outside your door. Our condo is ocean front corner unit on the 9th floor. Absolutely perfect! Only allows incoming calls as well as room to room calls. No outgoing calls are allowed. Useful for calling Security gate, room to room, concierge, etc. Bed Linens are provided at no cost to you. We have provided a couple of extra bed pillows as well to help you find one that is comfy. Blankets are provided as well.. Built in electric fireplace! Great in the winter as it provides heat, In the summer you can just look at it for ambiance and turn off the heat. Free Internet provided. Instructions are located in the unit. This includes bath towels, face towels, bath mats, kitchen towels/cloths. Beach towels are not provided but can be upon request. Not in the building but brand new health club inside Kingston Plantation can be used for $15 fee for those over 16 years of age. Indoor pool, splash pad, state of the art workout equipment. Spacious and beautiful views. Nicely appointed and nice furniture. 52' wall mounted new TV, sound receiver and speakers, built in electric fireplace--use for ambiance and heat or just the ambiance! Two dishwasher detergent pods are provided. Currently have Mr. Coffee and an I-Coffee which is like Keurig and uses same pods. Also stocked with electric tea kettle. We insure you have a full roll of paper towels, two coffee pods to get you started first morning, and spices for your use. Stocked with dinnerware, bowls, flatware and cooking utensils. You should have anything you need! Equipped with everything you should need! Kitchen has granite counters, pendant lights and new bar stools. Nice cookware, dinnerware and drinkware provided. Stocked with anything you should need! Cable provided. Upgraded cable channels and if you have a netflix account or roku you are all set! I have books - and offer a "take a book, leave a book" policy. Books will always rotate. Or just enjoy a book during your stay and leave it for other guests. Several board games - mostly for children. Puzzles offered as well. Beach toys and boogie boards are provided in the storage locker in the garage. We provide a few DVDs for rainy days or to entertain children. Four of them! Each room has a balcony with gorgeous views and plenty of room for comfortable seating. We try to maintain the balcony furniture to ensure they are comfortable and "newer". Available at the Health Club on site. Arcadian Shores right across the road from Kingston Plantation entrance is the closest. But there are hundreds of golf courses located in and around Myrtle Beach. With elevators it is wheelchair accessible. South Hampton has its own pool specifically for South Hampton Guests. Well maintained and equipped with tables and umbrellas. There is an additional pool on the left side of our building which is open for use by North Hampton building, South Hampton Building, as well as some of the villas located behind our building. Security Gate entrance 24 hours/day provides peace of mind. Starbucks is located right next door in Embassy Suites if you are a Starbucks lover. (Even though we have two options for coffee pots in our unit). There is dining, entertainment, golfing, shopping, dinner theaters, miniature golf and go-cart racing within minutes of the resort. Tanger Outlets are located only 1 mile away. Grocery shopping options nearby include Kroger, Fresh Market, Super Walmart, Publix and Food Lion. The beautiful new Health Club offers state of the art equipment, indoor pools, tennis, classes, and SPA services!! Anything you need is conveniently located either within Kingston Plantation or within minutes by car. The airport is approximately 10-12 miles away. There is a concierge located in Embassy Suites which you can reach by the house phone. The spa in the health club offers all services of an upscale spa--Call them for pricing and appointments. Beautiful condo! Modern furnishings and great location in Kingston Plantation. The condo owner is so helpful and accommodating. She goes over and above in making sure you are happy. I have stayed in many VRBO condos: this one is the best! The condo was just beautiful. The condo was spotless. The views were gorgeous from every room in the condo. Stephanie was just awesome to work with. I can tell how important it was for her guests to enjoy their stay. She thought of the so many details. We will definitely will return and tell everyone visiting myrtle beach to stay here. Thanks for a wonderful stay. Perfect location for our family. This unit had everything that we needed and more. When we return we will be staying here. Thank you for taking time to submit this review. I'm glad you enjoyed your stay here and I look forward to having you again in the future! Thank you John for taking time to submit the review. I really appreciate it and hope to see you again in the future! It is very difficult to describe the powerful effect that this condo had on all of us from the moment we walked through the door. The light...the space...the details.....the decor....It had the comforts of home but the beauty of an exotic vacation home. The views up the beach and out to the ocean were breathtaking. When we come on vacations like this, we usually don't spend a lot of time in the condo yet this time we did. Our favourite time was spent on the balcony eating breakfast at sunrise. Stephanie ensured that this experience was top notch and we are very grateful for this. We had everything we needed. We can't wait to go back. Thank you very much! I try to make sure the condo is comfy and uplifting and try to think of everything I would want out of a vacation property. I am very happy that you enjoyed it and look forward to your next visit. Many thanks!! We were rounding up our Florida winter getaway with a nine night stay at this beautiful beachside condo, a picturesque ocean view from every window. The condo was modern and clean and the bed was super comfortable. We'd go back in a minute. I highly recommend this place. Thank you for this! I am so glad that you were happy with our condo. I try really hard to think of everything one would appreciate while on vacation and I appreciate your recommendation. Thank you for choosing us as I know you had many options. Myrtle Beach is packed with activities and amusement for all ages. Check out the fun waterparks, race parks and other adventures. June & July bookings are Saturday to Saturday only. $120 exit cleaning fee required. Details will be provided by owner. Security deposit of $300 refundable once housekeeper confirms no damage or missing items. Smoking is prohibited so if housekeeper smells odor from smoking the security deposit will not be refunded. No pets allowed. Same policy as smoking if any evidence of pet in unit. Please contact owner for more detailed info.